Packages of 20 cigarettes each. 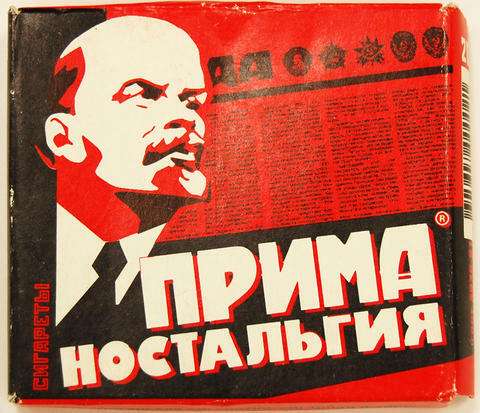 Red box bears Russian text and graphic portrait of Lenin. A graphic of the Soviet paper Truth is behind Lenin's portrait. Recto text reads: Cigarettes Prime Nostalgia. A side of the box reads: Cigarettes Fifth Class. The top reads: Smoking harms your health. On the bottom, the company's address is provided. Verso text reads "Prime Nostalgia". A Russian government label depicts the Russian emblem and reads: "Special Tabacco Brand" and "Russia". Recto: Prima Nostalgia/ Sgarettes. On background is frontpage of newspaper "Pravda"